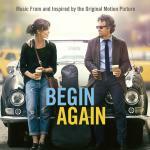 In the Begin Again film, from 12 to 16 songs officially considered as soundtracks, depending on which Internet source you read this. Always beautiful Keira Knightley and slightly shabby Mark Ruffalo play a young singer/writer of songs and once successful producer who has lagged behind the rapidly evolving music industry. One of those films that so fervently loved by critics from the Academy and not always favorably received by the audience. Rather impressive box office of more than 60 million dollars paid for the initial budget by more than 6.5 times, thus, it is impossible to say that the film is really memorable. Rather, the cute story with a happy ending. Title composition Lost Stars by Adam Levine was even nominated for an Oscar. It is noteworthy that the main characters of the film – Adam Levine and Keira Knightley sing movie songs with their own voices. Thus, the voice of Adam also sounds at three other songs. Especially enjoyable is a mix of already mentioned song. And Keira can be heard at such compositions like Tell Me If You Wanna Go Home (incl. RoofTop Mix), Like A Fool and the other two.